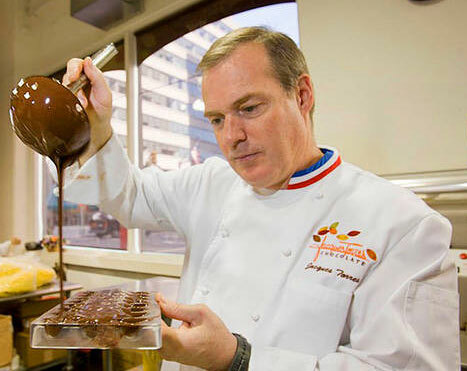 In the world of famous chefs Jacques Torres stands out for his accomplishments as a world-class pastry authority. His passion for chocolate has propelled him into the spotlight shared by other celebrity chefs. His rock star chocolate credibility, unrivaled in the field, is conveyed to eager culinary minds through Torres’ various educational efforts. The Chef gravitated toward the pastry arts at an early age when he challenged his culinary mind with an apprentice role at a French bakery. There was no turning back on a career that now includes credits as an author, owner/operator and dean of students. At this stage of his career, Chef Torres manages his many ventures while continuing to pass his genius to the next generation as an educator. As a teenager in France, Torres apprenticed in a bakery shop, appropriately named La Frangiapane. Following his 2-year pastry apprenticeship, he bravely begged a job in the kitchen at famed Hotel Negresco in Nice, France. Over the next few years his efforts were focused on mastering his craft and working to earn a degree as Master Pastry Chef. During these career building years, he started teaching baking to students, a pursuit that would come back into his professional life later. In the late 1980s Chef Torres was wooed by the prestigious Ritz-Carlton and moved himself to the U.S., first to Palm Springs, and then to Atlanta. Following his hotel stint, Torres stepped into the role of Executive Pastry Chef in a custom-designed kitchen in New York’s Le Cirque restaurant. Torres’ brand became linked to this fine French restaurant with a far-reaching reputation for some of the world’s best food. For 11 years, Torres refined his inventive technique in the custom kitchen that also served as a student chef-training facility. In 2000 Torres launched his own chocolate shop and factory. The brand has grown to include several retail locations and two factories. Cork-shaped Taittinger Champagne truffles exemplify the chocolate decadence found in his retail shops. Bars and traditional candy assortment boxes dial in the cocoa content to satiate the discerning chocolate palates of connoisseurs. Higher percentages of cocoa lead to darker chocolates that exhibit the biting and luxurious flavors that are unique to the product, while milk chocolate blends in greater amounts of sugar for the smooth and sweet dessert fix some chocolate lovers crave. Hot Cocoa mix has become a staple product online and at Torres’ retail locations because it loads the cup with deep chocolate love that is not cloying or sweet. This is an adult beverage that doesn’t resemble the dumbed-down hot chocolate standard of your youth. image courtesy of the VillageVoice. Chef Torres’ has been recognized as the Pastry Chef of the Year by several culinary organizations including the James Beard Foundation, and was placed into that organization's Who’s Who in Food and Beverage in America in 2003. Cooking for the president is another feather in Torres cap, as he was tapped with other culinary all-stars to prepare a meal for Obama. A Year in Chocolate and Dessert Circus are cookbooks written by Pastry Chef Torres that feature famous recipes from his career. The later shares its name with a successful TV series that features Torres creating his masterpieces before your eyes. A follow-up book called Dessert Circus at Home strives to further empower home bakers to amp up their output to a gourmet level. Food Network fame is also on the Chef’s resume as a result of his long running appearance as host of Chocolate with Jaques Torres. By wowing viewers with over the top desserts and presentations, Torres creates enthusiasm among captivated domestic foodies when he eventually deconstructs the recipes for recreation at home. His consistent presence on TV is a welcomed site for chocolate enthusiasts who enjoyed his appearances with Julia Child in her series Julia Child’s Master Chefs. Torres designed the prestigious New York City French Culinary Institute’s Classic Pastry Arts program in the early nineties. Today, Chef Torres serves as Dean of Pastry Arts and sometimes chef/instructor at the school. His hand picked faculty joins Torres in a prolific transfer of knowledge that produces the best and brightest pastry stars of the future. The coursework for pastry chef candidates at the school emphasizes hands-on learning that prepares them for employment within the specialty. Pulling sugar into delicate designs, dissecting chocolate chemistry, and understanding baking science and flavor principles are areas of mastery that students absorb during an intense and thorough education. Tarts, cookies, puff pastries, chocolates, breads and other baked goods become second nature to graduates of the Institute.